Maxwell’s demon can extract work from a single heat reservoir at a cost of spin angular momentum. In step (a), the demon has no memory and the gas in the heat reservoir is in thermal equilibrium. In step (b), the demon divides the reservoir in two, trapping the fastest moving molecules on the right side, and uses a heat engine operating between the two partitions to extract work. In step (c), the demon's memory is erased using a spin reservoir and the two partitions are allowed to return to equilibrium. Image credit: Joan A. Vaccaro, et al. Fig. 1. ©2011 Royal Society. (PhysOrg.com) -- Until now, scientists have thought that the process of erasing information requires energy. But a new study shows that, theoretically, information can be erased without using any energy at all. Instead, the cost of erasure can be paid in terms of another conserved quantity, such as spin angular momentum. In the study, physicists Joan Vaccaro from Griffith University in Queensland, Australia, and Stephen Barnett from the University of Strathclyde in Glasgow, UK, have quantitatively described how information can be erased without any energy, and they also explain why the result is not as contentious as it first appears. Their paper is published in a recent issue of the Proceedings of the Royal Society A. Traditionally, the process of erasing information requires a cost that is calculated in terms of energy  more specifically, heat dissipation. In 1961, Rolf Landauer argued that there was a minimum amount of energy required to erase one bit of information, i.e. to put a bit in the logical zero state. The energy required is positively related to the temperature of the systems thermal reservoir, and can be thought of as the systems thermodynamic entropy. As such, this entropy is considered to be a fundamental cost of erasing a bit of information. However, Vaccaro and Barnett have shown that an energy cost can be fully avoided by using a reservoir based on something other than energy, such as spin angular momentum. Subatomic particles have spin angular momentum, a quantity that, like energy, must be conserved. Basically, instead of heat being exchanged between a qubit and thermal reservoir, discrete quanta of angular momentum are exchanged between a qubit and spin reservoir. The scientists described how repeated logic operations between the qubits spin and a secondary spin in the zero state eventually result in both spins reaching the logical zero state. Most importantly, the scientists showed that the cost of erasing the qubits memory is given in terms of the quantity defining the logic states, which in this case is spin angular momentum and not energy. The scientists explained that experimentally realizing this scheme would be very difficult. Nevertheless, their results show that physical laws do not forbid information erasure with a zero energy cost, which is contrary to previous studies. The researchers noted that, in practice, it will be especially difficult to ensure the systems energy degeneracy (that different spin states of the qubit and reservoir have the exact same energy level). But even if imperfect conditions cause some energy loss, there is no fundamental reason to assume that the cost will be as large as that predicted by Landauers formula. The possibility of erasing information without using energy has implications for a variety of areas. One example is the paradox of Maxwells demon, which appears to offer a way of violating the second law of thermodynamics. By opening and closing a door to separate hot and cold molecules, the demon supposedly extracts work from the reservoir, converting all heat into useful mechanical energy. Bennetts resolution of the paradox in 1982 argues that the demons memory has to be erased to complete the cycle, and the cost of erasure is at least as much as the liberated energy. However, Vaccaro and Barnetts results suggest that the demons memory can be erased at no energy cost by using a different kind of reservoir, where the cost would be in terms of spin angular momentum. In this scheme, the demon can extract all the energy from a heat reservoir as useful energy at a cost of another resource. As the scientists explained, this result doesn't contradict historical statements of the second law of thermodynamics, which are exclusively within the context of heat and thermal reservoirs and do not allow for a broader class of reservoirs. Moreover, even though the example with Maxwells demon suggests that mechanical work can be extracted at zero energy cost, this extraction is associated with an increase in the information-theoretic entropy of the overall system. The maximization of entropy subject to a constraint need apply not only to heat reservoirs and the conservation of energy, Vaccaro explained to PhysOrg.com. The results could also apply to hypothetical Carnot heat engines, which operate at maximum efficiency. If these engines use angular momentum reservoirs instead of thermal reservoirs, they could generate angular momentum effort instead of mechanical work. As for demonstrating the concept of erasing information at zero energy cost, the scientists said that it would take more research and time. We are currently looking at an idea to perform information erasure in atomic and optical systems, but it needs much more development to see if it would actually work in practice, Vaccaro said. She added that the result is of fundamental significance, and its not likely to have practical applications for memory devices. Could Maxwell's Demon Exist in Nanoscale Systems? I wonder if there isn't some misdiagnoses here regarding information's physical nature. It seems to me that information necessarily has to be represented physically or else it doesn't exist. If the physical representation of the information is anything but random then some kind of "ordering" went on, whether the work was done with energy, or use of a spin reservoir. Ultimately I think we can come up with an energy equivalent to describe the minimum energy required to represent a certain piece of information. Maxwell's daemon is an interesting thought exercise, but ultimately its all just conversion from one form of order/lack of order to another. What is information without some physical representation? It seems to be that they are simply trading one form of energy (thermal) for another (kinetic) and not considering a change in inertia (angular spin momentum) as a change in energy level. Shouldn't even the opening and closing of the door in the Maxwell's Daemon analogy require the expenditure of energy? I think Physorg member MaxwellsDemon had the best idea in a November 15, 2010 Physorg article titled: Maxwell's Demon Demonstration Turns Information Into Energy. I assume MaxwellsDemon was saying that the odds of the demon creating work are very minute, however the odds are there. You cannot exchange momentum without exchange of energy, so that the article title/outcome is an apparent nonsense. Can't we just set up storage so that we swap an iron atom with a gold atom, where gold (bit=1) and iron (bit=0)? We just need little nano bots to swap them in and out. How are you translating angular momentum from one object to another at no energy cost? Moreover, how does any engine whatsoever work at the quantum level, seeing as how a quantum engine would seem to require that an engine would always have either exactly 100% efficiency or exactly 0% efficiency. Moving gold and iron atoms would require millions of times more energy than moving electrons as in RAM, or spin charges like in racetrack memory prototypes. The devil needs to know when and how to divide the box in two parts. This requires knowledge, which has to be stored somehow. the energy that he gains from creating the differential (in heat), is the minimum energy he needs to know how and when to create the partition. Hence, he needs to use extra energy.which is unaccounted for here. For those that missed it, the overall system turns angular momentum into work. (Look at the arrows on the diagram.) I remember seeing a motor-generator set at the National Magnet Lab, that did this quite efficiently due to the large flywheel between motor and generator. The novel point here is that the step in which memory is erased consumes angular momentum, not entropy. Previously it was believed that there was an irreducible minimum amount of energy consumed to erase a bit. This amount is much, much less than is used in any existing computer. But it was believed to set a limit on data storage. (Funneling all that energy into a small space is likely to disintegrate the memory rather than erase it.) This thought experiment shows that a clever design might get around that limit. Incidentally a much more interesting side effect is that it should be possible to build computers where only erasing data takes energy. If you look at real computers, they overwrite data all the time. It sounds like you are talking about the sub-Planck domain? Lots of weird stuff can happen there! This all seems like a semantic argument. The second law of thermodynamics, maybe, should be expanded with a new formulation to include other forms of order/disorder. 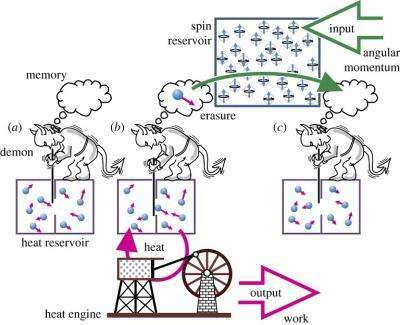 Creating a spin "reservoir" capable of erasing a bit takes "work" somewhere else. I'm not sure where writing data comes into this exercise, but I think there might be an argument that erasing the daemon's memory is writing a 0. Again, semantics. IMO you can't create order without some cost and that can ultimately be converted to energy consumption. Wonder if this discovery has any bearing on the fate of information in black holes? Word candy isn't candy, after all. I gave you a perfect plan, don't bother me with details... heh.. So you need a qubit and a spin reservoir in order to "reset" the qubit, ie opening the trap again without increasing entropy? What about the conditions needed to create the qubit and the reservoir? Some entropy there, no? Guess that's why there's no free lunch. Should I have said strange? QM uses the term strange all the time. At this point in time the sub-Planck domain is really really really weird. At least this lays to rest the idea that energy and information are equivalent entities. Information seems to be more fundamental. If true then this paper hints at an underlying connection (or 'force') between energy and angular momentum and that the two are merely aspects of this entity. If true then this paper hints at an underlying connection (or 'force') between energy and angular momentum and that the two are merely aspects of this entity. Um..."energy" IS related to force, and doubly related to momentum and angular momentum. A force does work on an object. Work is any change in kinetic energy. Any change in velocity will change kinetic energy, either by changing the orientation of the vector, or by changing the size of the vector. Angular momentum and linear momentum are functions of mass and velocity, whether the velocity of motion, or the velocity of spin, or the velocity of an orbiting body. rest mass collapses to an expression of energy by E = mc^2. Velocity of an object could be expressed in terms of force, and therefore work, and therefore energy needed to accelerate it to said velocity. Therefore every component of force, momentum, and angular momentum can be expressed in terms of pure energy variables collapsed to a single value. Both are in units kg*m^2*s^-2. Energy is usually interpreted as 1 dimensional entity, but the units themselves betray energy is actually a multi-dimensional quantity: A "Hyper-volume", as it were. Now if you differential Ek with respect to v, then you get the Momentum formula. So I am pretty sure I have collapse EVERY scientific unit to a manifestation of energy by one relation or another. "Meter" and "second" is collapsed by default through velocity. Is the special case of the work formula for v1 = 0, with some massaging, to get v by itself. Since work and mass are both "energy" then velocity must be a function of "energy". If you fool around with the math here, you'll find the units work out. However, here "v" is actually "delta v". Can you provide me with some kind of a hint what an equation for the ToE would look like? Seriously! Any ideas? Spin is quantized angular momentum, not classical momentum. In classical physics stopping a mass from spinning requires force that allows you to make the link to energy. Stopping an electron's spin is not possible, it is either up or down. And no, I have no idea what using a spin reservoir to erase the daemon's memory means, although I agree there must be some energy equivalence there. Spin reservoir would mean (I think) that you have a set of entities with spin (e.g. electrons) which have an orederd spin. You then use the reservoir to erase the daemons memory which turns it into an ensemble with less ordered spin. So, another one of physics cherished beliefs might be wrong? I'm shocked. And another paradox that isn't, shocked again. Assuming all this is true of course. Does this mean that, contrary to some theories, information CAN be destroyed? Regardless, I never believed that theory anyway. Actually such experiment can be understood easily, if we realize, the liquid helium never freeze at the absolute zero, because of its atoms are in neverending motion due the quantum fluctuations of vacuum. So if we polarize helium atoms with strong magnetic field, we can orient them by their spin. If we shutdown this magnetic field, we could observe, how the the system of helium atoms gets randomized, while still remaining at the zero temperature. Actually such experiments were done recently with nuclear spins of paramagnetic silver and rhodium alloys. To avoid informational paradox, a negative picokelvin temperature has been assigned to the organized spin state. Move along folks, nothing to see. there is no free lunch here. The energy used to set up and even have this "reservoir" more than makes up for the "no energy cost" of erasing information. Entropy can not be cheated. As evolution theories has shown us, defects can occur from time to time allowing change for the better or for the worst, or something like that. Maybe Ethelred can make better sense of what I just said, or maybe not?